When I was 25, I was ordained to go serve as a minister on Cape Breton Island, Nova Scotia. Over the course of five years, I spent time with these people who were complicated, quiet, and compassionate. The accents, the food, and the friendliness were only matched by the tempers, the laughter, and the grudges that extended beyond generations. One of the churches had closed; however, people liked it sitting in the woods as a silent sentinel of what had once been, as schools, post offices, and churches closed around them. 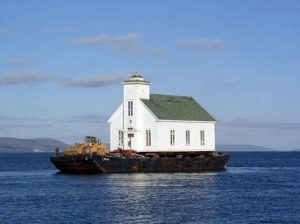 When an opportunity arose to float this old church (1874) 15 kilometers down the lake to the Roman Catholic village of Iona (where a village representing the culture and buildings of Cape Breton’s history was located) there was fierce debate. One last elder of the church, a man in his 90s by the name of George MacIntosh, finally gave his blessing. And the church set sail, to my spiritual home in Iona, Cape Breton, over looking Grand Narrows across the water. Any notions I had of what church was or could be were shattered that day. Some locals said it would sink on the way. An old priest from the area was rumoured to have said, “I’ll be damned if they let a Protestant church in Iona!” But, it was greeted on the shores by villagers with a wreath on its door, and then it set sail. It made the slow journey up the hill where it now sits, welcoming our ancestors and new friends on the Barra Strait, where it once sailed. Then, offer your prayers in this sacred space. Because the church is on the move.